JAY COFFEY: (Weekdays 10a-3p) Jay’s been Rockin’ N’ Rollin’ for decades, beginning as a bass player in San Francisco Bay Area rock bands. 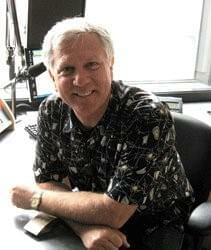 His radio career begin at a small 5000 watt AM station in Modesto California, and after four years moving around Central California he wound up playing the hits in Los Angeles for over 28 years. A lifelong lover of Golden retrievers, he acquired somewhat of a tolerance for miniature Schnauzers thanks to his wife, Janet who’s been afflicted with Schnauzer-itis since her childhood on Long Island New York. Jay is dedicated to making radio fun and informative for his listeners.